« Translation as a career? It’s right up there! Product naming is an important part of branding and marketing, and one where international businesses can make costly mistakes if they fail to understand local language, slang, and all the connotations of a given word. FITTA This car was hastily rebranded the “Jazz” for the Scandinavian market after Honda discovered that “fitta” is a colloquial term for a woman’s private parts in no less than 3 Nordic languages. PAJERO This word is a colloquialism denoting masturbation in Spanish, so Mitsubishi saw the wisdom of renaming its “Pajero” SUV as the “Montero” in Spanish-speaking countries. Shanghai Auto came up with Roewe, a Roverish name with Chinese characteristics. However, one can only assume that quiet consternation engulfed company headquarters when it was discovered that the Chinese version for Roewe — Rongwei — sounds close to English-language Wrong Way. Have you got any examples of branding or product-naming gone wrong? Let us know in the comments. The car industry’s poet laureate, or what’s in a name. 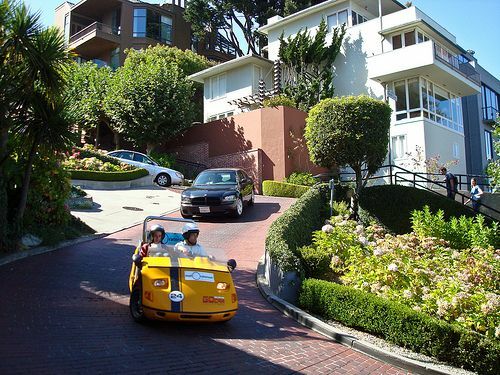 The photo, courtesy of David Perez, shows cars zig-zagging down San Francisco’s Lombard Street. Two car names that did not work very well in the Italian market were Musso, which in some northern Italian dialects means “donkey”, and Sorento, which looks like a spelling mistake of Sorrento. I’d never heard of Kadus – but no, it certainly wouldn’t give the right message in Italy. It doesn’t sound very soft appealing for English-speakers either, IMO. Love the car ones – made me chuckle. Can’t think of car one but Pschitt fizzy drink didn’t tempt me, nor did Kick-self (self service Kickers store in France) and Grill-self for a motorway cafe! Oh yes, Pschitt – certainly not very appetising, although I can see the onomatopoeic (phew – spelling!) effect they’re aiming for. I hadn’t seen Kick-self or Grill-self — the latter would make an apt name for a tanning salon here in Glasgow. Other examples (although these companies were wise enough not to market with that name in Spain) are Nissan Moco, “snot”, and Ford Nika, which sounds like the imperative form of “to fornicate”. Actually just read in N. Kelly & J. Zetzsche’s “Found in Translation” book that ‘Kuga’ also means ‘plague’ in Croatian and Serbian!